My sports viewing life is no longer about road trips or even about games, but now about trying to get to as many new venues as possible. So much to see, so little time. Working in New Jersey gives me few opportunities during the week, but I had the past week off and was finally able to get out to the Bronx to see Manhattan basketball as they hosted MAAC rivals Canisius in a Friday night tilt. 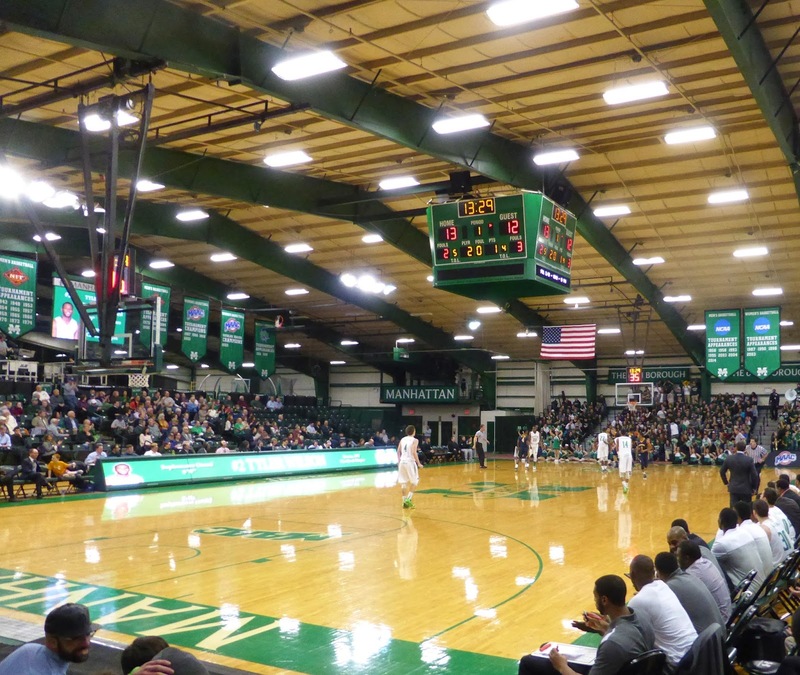 Manhattan College was founded back in 1853 on the island of Manhattan and moved to the Bronx in 1922 without changing their name. 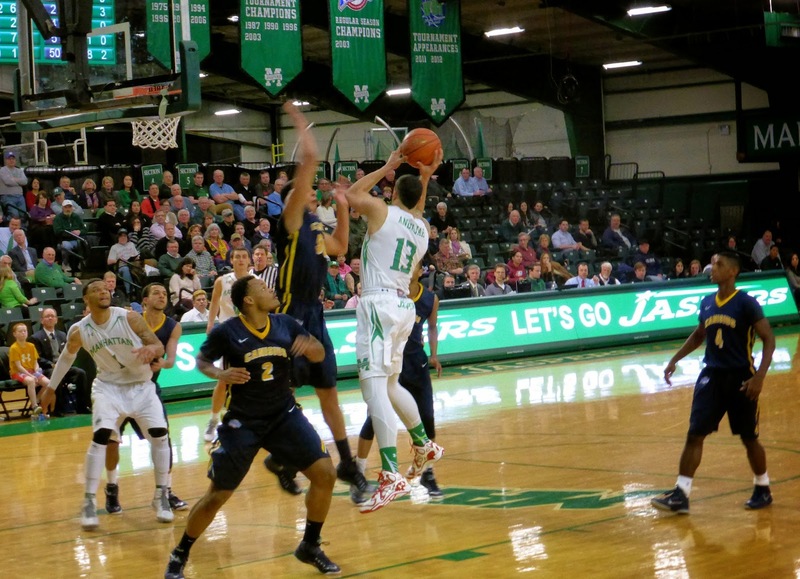 The Jaspers play in Draddy Gymnasium, located at the top of campus and tough to get to if you don't know where you are going. Take the 1 train to the final stop at 242nd Street, and walk over to Post Road, taking the stairs up to the campus. Turn left and keep walking, going up whenever you find stairs. Eventually you will find yourself in front of the gym. The cheapest tickets were $10, which allowed you to sit behind one of the baskets (view above, with the Manhattan bench to the right). There were nearly 1,400 fans in attendance, a surprisingly large crowd that meant few easily accessible seats. There were even ushers, something you rarely see at this level. I always enjoy attending these events that are completely off the radar; no one would have guessed that there was Division I basketball just a few minutes away from the subway as there are no signs whatsoever. 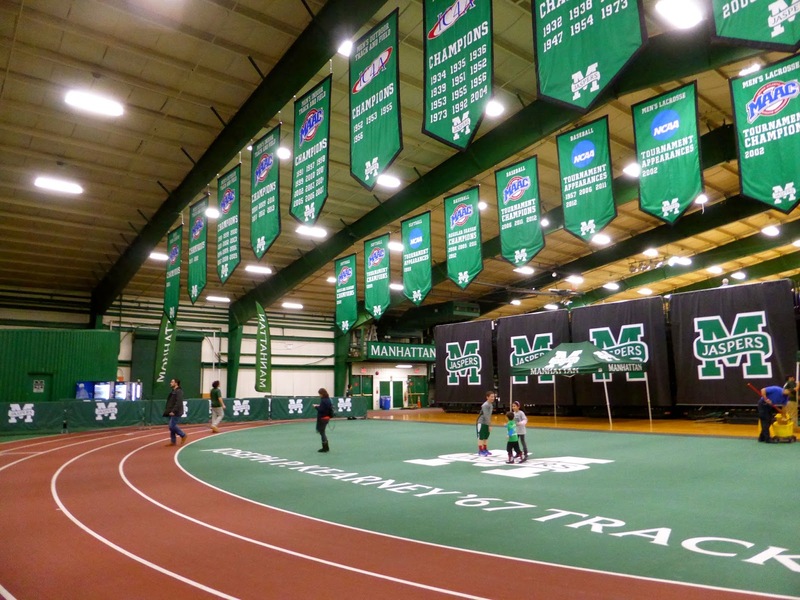 The court is set inside the running track, with dozens of MAAC championship banners on display (above). The crowd, with a large number of students celebrating the start of the weekend, was very energetic and loud from the start, with the band, cheerleaders, and dance team keeping things going throughout the game. 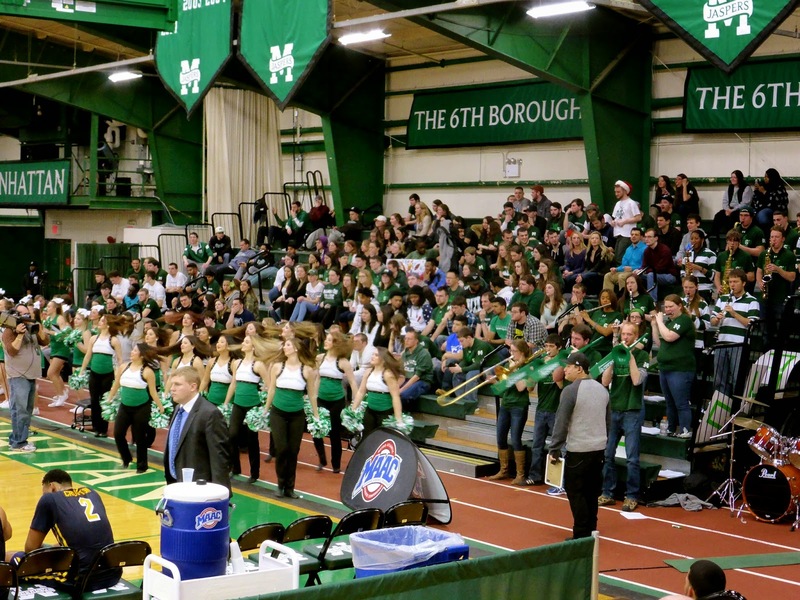 The student section refers to itself as the 6th Borough, a play on their location and name I would surmise. Whatever the reason, it is one of the best I've seen in a smaller school. Near the end of the game, I finally moved around to the sideline seats, which offers a better overall view. 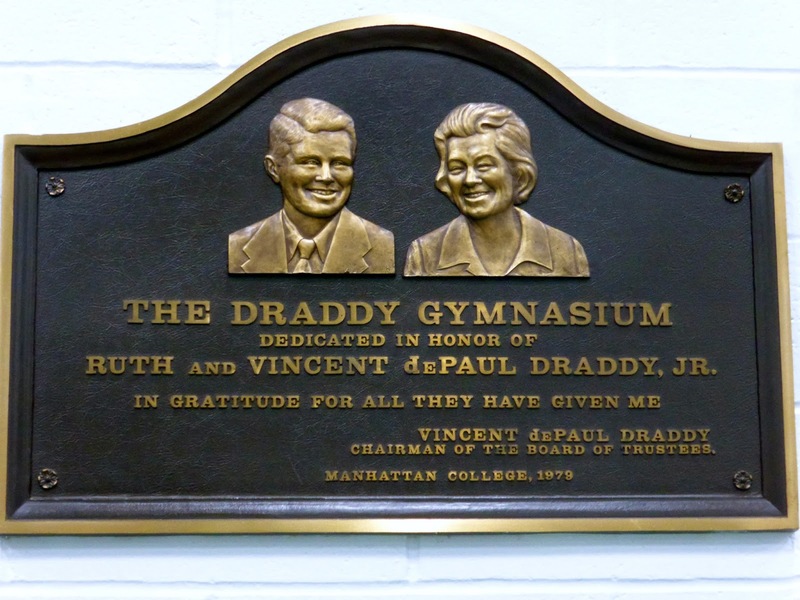 I was really impressed with Draddy Gymnasium and its crowd, a step up (literally) from the other places I have visited in the greater New York area. I hope to be back in the near future. 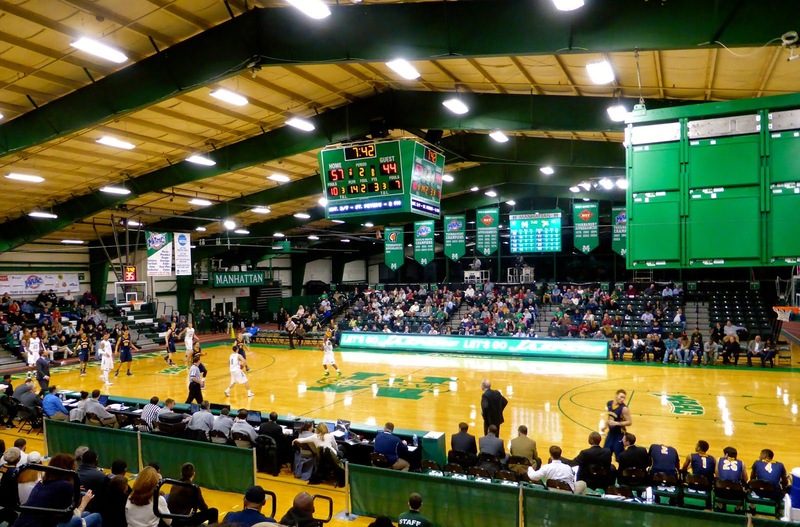 Manhattan entered the contest at 8-4 in conference play, a game ahead of Canisius, who hail from Buffalo. 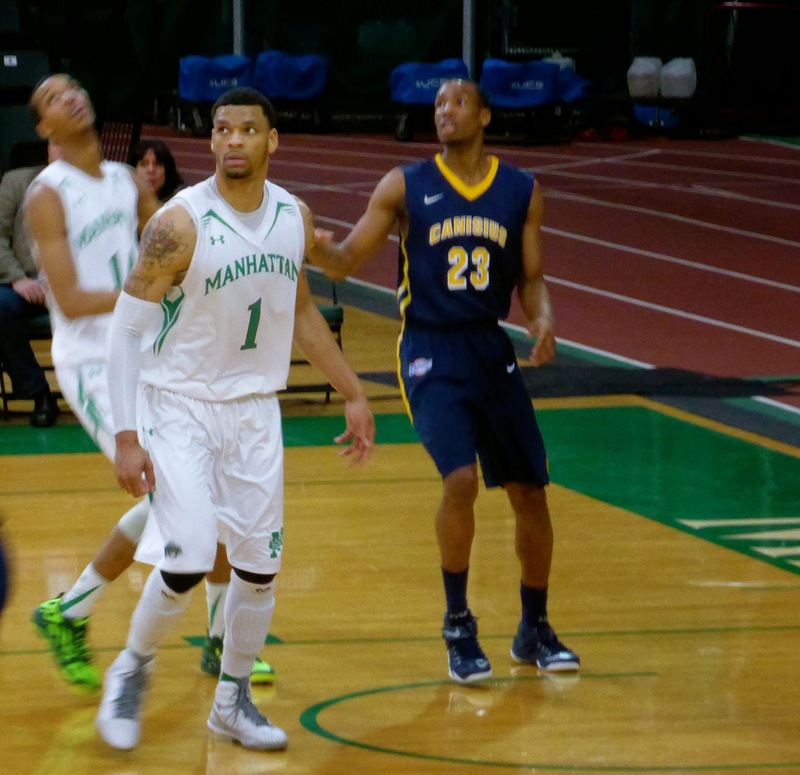 The first half saw a lot of back-and-forth, as the Jaspers took a 17-12 lead, only to have the Griffins come back on a 15-7 run before Ashton Pankey (#1 below) sank a couple of shots as Manhattan took a 30-28 lead into the half. I was expecting a good second period, but the Jasper defense came out strong and limited Canisius to few good shots, of which they missed every one. At the first media time out, Manhattan had a 12-0 run to start the half, and this extended to 21-3 at the second time out. Game over, right? Not quite. As is often the case, a team with a big league takes their foot off the gas and Canisius finally got a few shots to go, getting back within 5 after a Zach Lewis layup made it 67-62 with 2:32 to go. 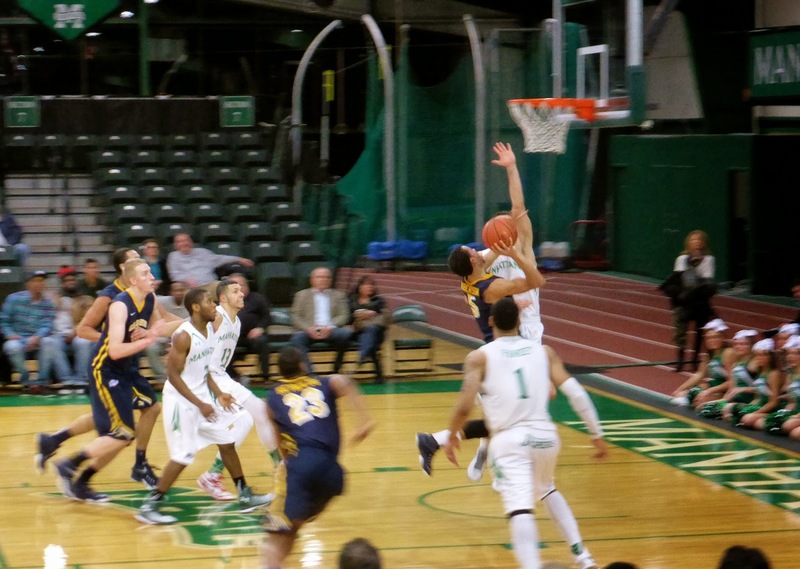 After that, Canisius started to foul, and Manhattan sank 10 of 11 to prevent the Griffins from getting any closer, running away with it at the end, 78-69. 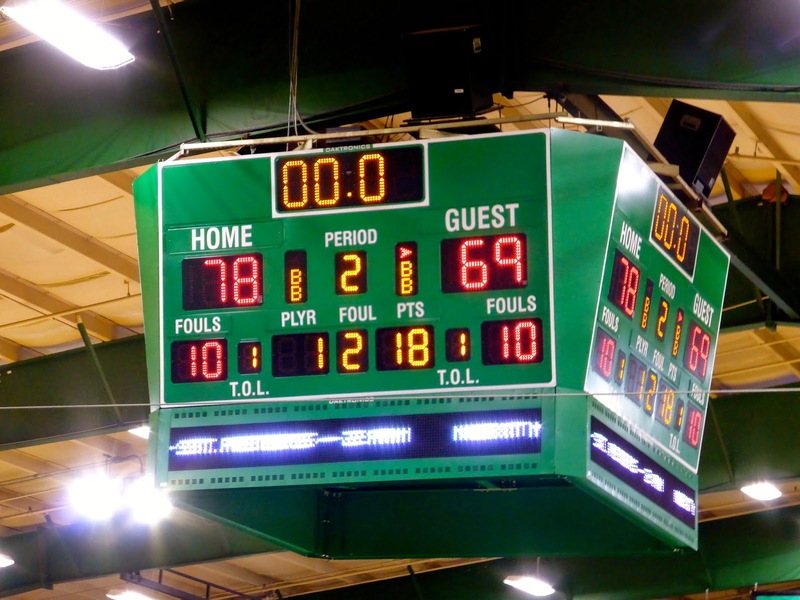 This was a typical NCAA game to me in that the officials took over down the stretch. The first half saw just 12 fouls called, while the second half was a whistlefest with 36 infractions registered, killing any flow. Each team had 24 fouls and 31 trips to the line as well as 20 turnovers and 6 blocks. The Jasper victory was due to their shooting inside the arc where they went 18/37 compared so Canisius hitting only 14 of 43 shots from close range. Pankey finished with 18 points while Emmy Andujar (#13 above) led the Jaspers with 20, while Lewis potted 25 to pace the visitors. The last game I saw ended in the same score. Like I said, a typical NCAA game.